This is a design project I did last Winter when I interviewed for a startup called Wish. Wish is a E-commerce app that sells very cheap products like $1 earphones and $10 camera. I was interested in E-commerce market, so I applied. During their design interview, I was given a take-home task to design a feature that would increase sales. As a person who never used the app before, I first downloaded the app to explore as a user. During the exploration, I ended up not buying any product. I had a general intuition of the reason, but I went back to step 1 to take detailed notes of my thought process to figure out the why I didn't buying anything. Many of the reviews do not have images, and without images from the past buyers, we as users don't trust the product. Many of the reviews just say "good product" which are hard to trust. Some of us want to see 3 or 4 star reviews because they tend to be more honest. Trust is a core theme that is lacking on Wish. + Wish is losing Trust on the product review page, because users aren't seeing the reviews they want to see. And with research, I realized what Wish was missing: a filter feature. Currently, we have reviews in chronological order. But with this filter feature, users can filter to only see reviews with images, or reviews with specific rating like 3 star, or even show relevant ones - one of my friend wanted to check out specifically the battery life of the airpods and the other one cared about sound quality. Filter system could show the users reviews that they want to see and gain their trust to increase sales. However, I asked myself: Users can now quickly see all the reviews with 1 star. Is this bad? Intuitively, I thought maybe it's really bad, because if they filter and they find out there's a lot of 1 star reviews, the chance of them buying that product will now be 0. 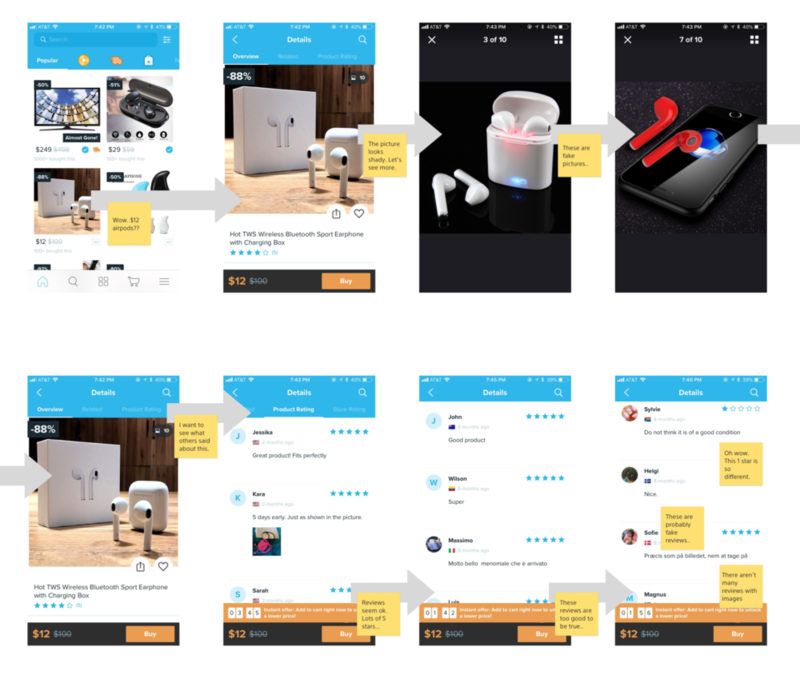 Before diving into the design, I did a competitive analysis with Amazon to understand how they approached this feature. Organized, Filter by Most Liked Reviews, Filter by Ratings, Search Keywords. For Wish, I wanted a way to apply multiple filters at a time, because a user might want to see both the 5 star reviews and with images to boost that trust in the product. The goal here was to make the filters as compact and intuitive as possible. Here are my explorations. Even though it's more organized, it takes more time to apply the filter one by one. Cluttered but easy to select and deselect. Below is the high fidelity. It's clear when the filter is on or off. It's clear that users can combine filters. As for keywords, these buttons are better experience than search, as users do not need to type. But we would somehow need to know which reviews are related to, say, sounds quality. We can 1. let users tag themselves when they leave a review or 2. we can set up keyword list for each of those filters - sound quality include "sound, audio, and base". Simple, but a study show that many people up-votes without thinking, because it's easy and anonymous. If everyone up-votes, then the votes are not trustworthy. Comment can create a community feel, where users can interact under a review to ask each other how the product was. But I have to consider the scope. This could be later in the milestone, but I wanted to see if there are easier options. This is the alternative solution I came up with. Essentially Wish is paying previous buyers to thank reviews. Those thanks will lead to a trustable review which will lead to more users trusting the platform and increasing the sales. Coupons will keep users on Wish, because users now want to use the coupon to buy more products. The rule of coupon has to be clear like it only applies to $10 or less items & must be used by near future. But I believe it is a great way to increase trustability in the reviews. Here is the high fidelity design with the filters and the thanks feature. Filter is exactly what they needed. They feel like this will definitely increase their chance of trusting and buying the product. They like the simplicity of the filter feature and they thought it’s really easy to use. But a lot of them felt like coupons might not be a sustainable solution. I agree, but I do think it’s important to make some reviews credible. I wish I can talk to Wish’s PM or the finance team to research more about this idea. Overall, I’m satisfied with my process and solution. I felt like I was very in depth on this topic of trust, and I hope Wish implements this to increase their sales!